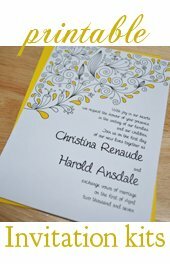 Handmade paper wedding invitations are classic and elegant. You simply cannot go wrong with this kind of invitation, which can be paired with so many wedding themes from the classic and traditional, to a rustic country or garden wedding. 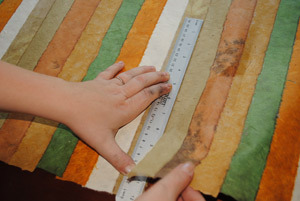 These days the selection available out there for handmade papers is impressive. You are bound to find something to suit your needs or wedding colors. 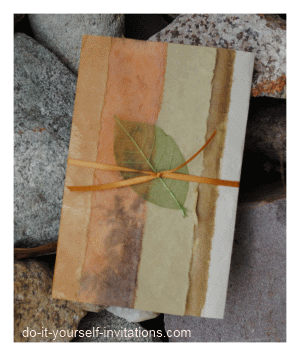 My absolute favorite place to shop for handmade papers is Creative Papers Online. The selection is fantastic and they always have a lot of great items in clearance as well. Not to mention their paper cutting services which can be a life saver for any DIY bride. I shop there personally and LOVE it. There are a couple different ways to create these kind of invitations. Truly just about any kind of invitation you want to make can be created with this kind of paper. But I want to share with you two of the more simple projects. Like you don't have enough on your plate planning a wedding to have to create a crazy complicated wedding invitation, right? 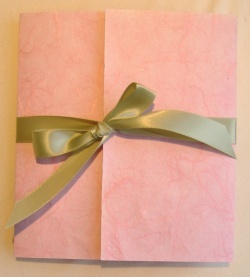 The absolute most simple and easy way to create an invite using handmade papers is to start with a blank card. For this particular Invitation design I am referring to a standard folded card, which you can buy pre scored and folded, in different colors and even with matching envelopes! 3. 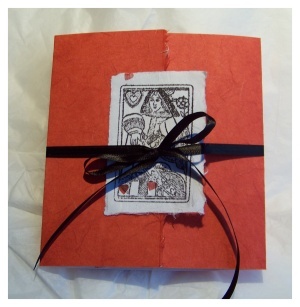 Attach a piece of handmade paper to the outside of the card. You may have to cut it to the size of the unfolded card, or to keep the rough edge score it and rip the paper against a good sturdy ruler. 4. Decorate with ribbon, a belly band, dried flowers, or skeleton leaves. You could even use a thick satin ribbon to tie the card shut with a bow. This often gives a beautiful effect. Many handmade papers are impossible to print onto. If this is the case you will need to print onto separate paper and then attach it to the handmade paper. I always opt to print onto vellum and then attach that to the inside of the wedding invitations. Vellum lends an invitation a touch of elegance. 1. Print your invitation text 2 up onto 8 1/2" by 11" vellum. If you need help you can use our free wedding invitation templates. 2. Cut the vellum in half or have it cut for you at a local copy shop. Trim the edges about 1/4" all around, or to the desired size for your invitations. 3. Fold a piece of 8 1/2" by 11" handmade paper in half. If the paper you bought is in large sheets as they often are, you can cut it to the desires size or have it cut for you. Attach the printed vellum to the handmade paper using a either a small brad, or use a ribbon punch to punch some holes to thread a ribbon through and tie in a bow. A tri-fold held together with a thick satin or velvet ribbon gives a really rich and modern elegance. This works best with a heavy weight handmade paper. 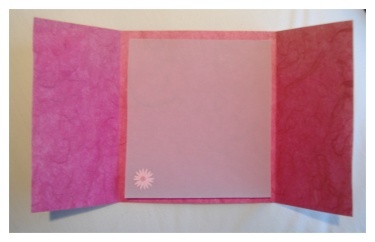 You can layer vellum or printed cardstock to the inside of the invite to show the invitation wording. 1. Start with a heavy weight handmade paper.I prefer to cut the paper to 12" by 6", so that after folding the invitation becomes roughly a 6" by 6" sized invite. 2. Print onto some vellum or cardstock to create 6" by 6" inserts for the inside of your invitations. 3. Measure the paper and mark where the exact middle is (at 6 inches). Fold the edges in one by one so that they overlap the middle point slightly. I recommend scoring the paper before folding. A great scoring and folding tool is a bone folder. It is super affordable and will help you make perfectly creased cards. 5. After folding the card and attaching the wording to the inside tie a ribbon around the card to hold it shut. Las Vegas Wedding Invitations made with handmade mulberry paper. These are very similar to the gatefold invitation. Fall Theme Handmade Paper Wedding Invitations created using a lighter weight handmade paper. This paper was very unique and fun to work with. Also a variation on the gatefold. 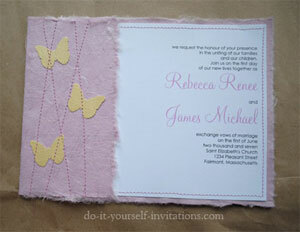 Butterfly Wedding Invitations handmade machine sewn with silky handmade paper. The paper was an elegant cotton paper with silk strands woven throughout. So luxurious and beautiful!